Few disciplines lend themselves so perfectly to a titanium frame as cyclocross. In a sport where durability, speed and ride quality are critical, titanium bikes shine brightest. The Broken Arrow delivers on the material’s promise in spades with the light weight, stiffness and vibration damping ability expected of a modern top-tier cyclocross bike, with the additional benefit of titanium’s durability and crashworthiness. Equipped with disc brakes, thoughtful cable routing and generous mud clearance, the Broken Arrow is ready to lead races from tape to tape. Knowing the punishment that cross bikes are subject to every weekend, the complete Broken Arrow strikes the perfect balance between light weight and durability. A Chris King headset, Thomson stem, seatpost and cross-specific carbon bar, Enve carbon cross fork and Praxis cranks and bottom bracket are all among the highest quality, most durable components available. SRAM’s cyclocross specific Force CX1 groupset serves up crisp shifts without the dropped chains and mud catching issues of a front derailleur. 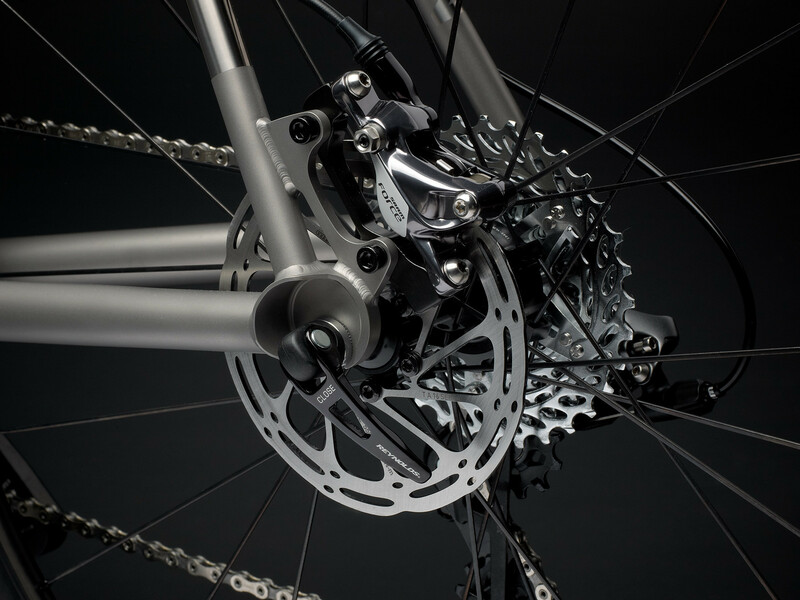 SRAM’s outstanding Force hydraulic disc brakes provide great stopping power and excellent modulation in all conditions. What makes titanium the ideal material for the Broken Arrow? A well-designed titanium frame strikes the perfect balance of low weight, smooth ride quality, and remarkable durability. 3Al-2.5V titanium offers a strength-to-weight ratio far better than aluminum or steel, which allows us to achieve more frame stiffness with less material. What makes titanium the stuff of framebuilding legend, however, is the material’s ability to soak up bumps and vibration. A great titanium frame keeps you feeling fresh in the saddle through to the last lap of a cyclocross race, but with none of the overdamped, wooden ride quality of many carbon frames. Based on our already versatile Great Divide road model, the Great Divide Disc is the perfect well-rounded road bike. With ample tire clearance, plenty of all-weather stopping power and the all-day comfort that only titanium can provide the Great Divide Disc is ready to tackle roads of any description. The Great Divide Disc has been designed to showcase the best characteristics of titanium while embracing the latest developments in frame design. 22mm chain stays and an oversized, bi-ovalized down tube are bridged by a PressFit 30 bottom bracket shell to provide stiffness and instant response under power. An oversized head tube accommodates the latest tapered forks while strengthening the bike’s front end for confidence-inspiring steering precision and cornering stability. Tempering these characteristics are a svelte seat tube and seat stays designed to keep the velvety ride quality that titanium is legendary for. Taking the Great Divide Disc from paper to the shop floor starts with the selection of the highest quality 3Al-2.5V cold worked stress relieved (CWSR) titanium tubing. The frame’s main tubes are then each double- or triple-butted by CNC lathe, varying wall thickness for each size of frame. The tubing is then precisely shaped, mitered and welded by some of the top titanium craftsmen in the industry. The Great Divide Disc is available in three standard finish options: our minimal “raw” finish, with polished titanium graphics against a matte titanium backdrop, or with an optional striking high-polish anodized finish in either blue or bronze. What makes titanium the ideal material for the Great Divide Disc? A well-designed titanium frame strikes the perfect balance of low weight, smooth ride quality, and remarkable durability. 3Al-2.5V titanium offers a strength-to-weight ratio far better than aluminum or steel, which allows us to achieve more frame stiffness with less material. What makes titanium the stuff of framebuilding legend, however, is the material’s ability to soak up bumps and chatter in the road. A great titanium frame keeps you feeling fresh in the saddle even after long hours, but with none of the overdamped, wooden ride quality of many carbon frames. The Great Divide has been designed to showcase the best characteristics of titanium while embracing the latest developments in frame design. 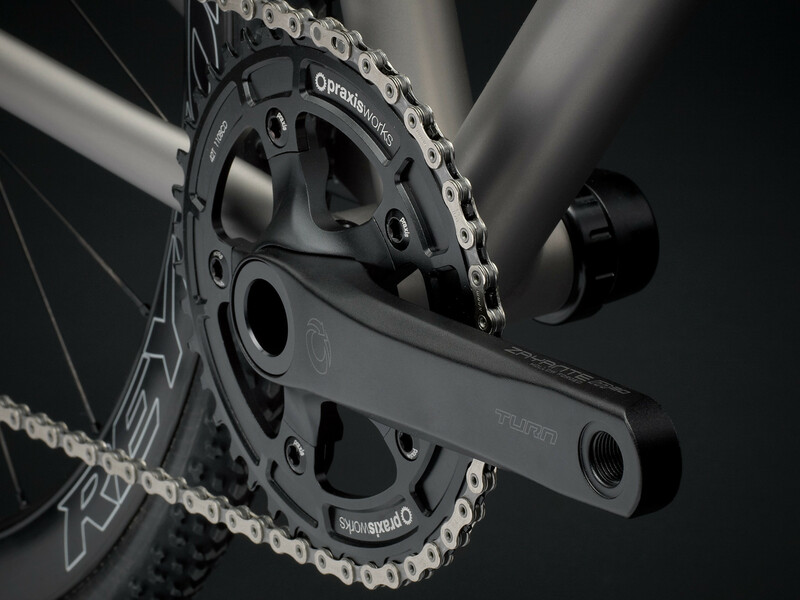 22mm chain stays and an oversized, bi-ovalized down tube are bridged by a PressFit 30 bottom bracket shell to provide stiffness and instant response under power. An oversized head tube accommodates the latest tapered forks while strengthening the bike’s front end for confidence-inspiring steering precision and cornering stability. Tempering these characteristics are a svelte seat tube and seat stays designed to keep the velvety ride quality that titanium is legendary for. Taking the Great Divide from paper to the shop floor starts with the selection of the highest quality 3Al-2.5V cold worked stress relieved (CWSR) titanium tubing. The frame’s main tubes are then each double- or triple-butted by CNC lathe, varying wall thickness for each size of frame. The tubing is then precisely shaped, mitered and welded by some of the top titanium craftsmen in the industry. The Great Divide is available in three standard finish options: our minimal “raw” finish, with polished titanium graphics against a matte titanium backdrop, or with an optional striking high-polish anodized finish in either blue or bronze. What makes titanium the ideal material for the Great Divide? A well-designed titanium frame strikes the perfect balance of low weight, smooth ride quality, and remarkable durability. 3Al-2.5V titanium offers a strength-to-weight ratio far better than aluminum or steel, which allows us to achieve more frame stiffness with less material. What makes titanium the stuff of framebuilding legend, however, is the material’s ability to soak up bumps and chatter in the road. A great titanium frame keeps you feeling fresh in the saddle even after long hours, but with none of the overdamped, wooden ride quality of many carbon frames. The real beauty of the Little Wing lies in its details. The dropouts, for example, are unique to the Little Wing and each is machined from a single bar of titanium, making them stronger and lighter than typical two-piece welded dropouts. Based on feedback from our racers, these dropouts allow for a full inch of fore/aft adjustment, which allows track racers to more easily change gearing at the track without breaking the chain. The Little Wing’s seat mast topper is a functional work of art. Made from cast titanium and then precision machined, at 120g including Enve hardware our bespoke topper is light, strong and beautiful. What makes titanium a great match for the Little Wing? 3Al-2.5V titanium offers an incredible strength-to-weight ratio, which allows us to achieve more frame stiffness with less material. On the Little Wing this translates into incredible crispness and responsiveness. This responsiveness, however, doesn’t come at the expense of ride quality. The resilient, road-smoothing ride quality that popularized titanium frames decades ago stays kindled in the Little Wing.